With LED technology, the energy-efficient, 32-inch Samsung Series 4 TV produces a brilliant, clear picture. The Dolby Digital Plus/ Dolby Pulse is an advanced surround sound feature that optimizes the TV's audio from connected devices. With LED technology, the energy-efficient, 32-inch Samsung Series 4 TV produces a brilliant, clear picture. The Dolby Digital Plus/ Dolby Pulse is an advanced surround sound feature that optimizes the TV's audio from connected devices. And the Wide Color Enhancer Plus feature lets you see picture color with vibrant, natural-looking images. Is a comprehensive measure of a TV's ability to display images in motion. The higher the CMR the better. Samsung achieves high CMR numbers based on panel processing advancements. 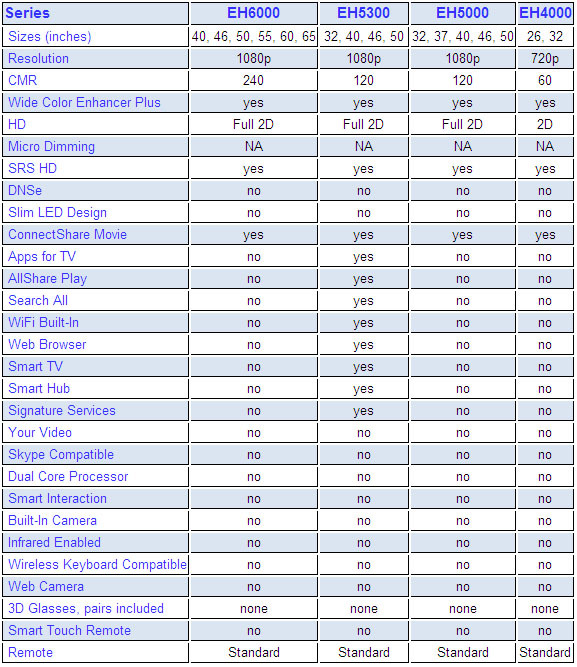 See the picture quality difference for yourself. Allows you to see picture color the way the director originally intended. Witness the entire RGB spectrum brought to life on your screen to bring you exceptionally vibrant, yet natural-looking images faithful to the director?s original intent. Supports multi-channel sound (MTS) and second audio program (SAP) with 181-channel capacity. An advanced surround sound audio processing feature designed to optimize the TV?s sound quality when viewing and listening to Internet movies, Internet music and other content played back from wired or wireless mobile phones, PCs and tablet devices. A high-definition audio experience that delivers surround sound multi-channel content, using built-in TV speakers to significantly enhance both the depth and dimension of audio right through the TV. Enjoy a simulated surround sound experience! Have movies and pictures on a USB drive? Now easily view that content right on the TV. Just plug the drive in the USB port and you are ready for a big screen experience.